Zoho Analytics is seamlessly integrated with both on-premises and on-demand versions of ManageEngine ServiceDesk Plus. 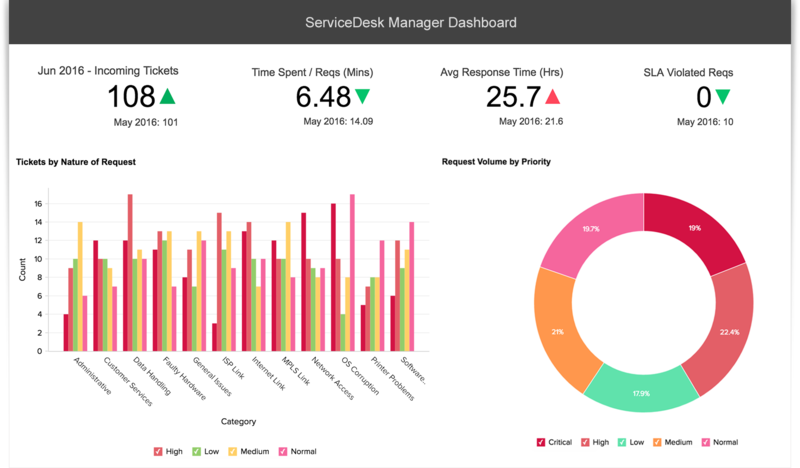 Visually analyze your ServiceDesk Plus data, and create insightful reports & dashboards. Share reports together with your colleagues and collaboratively analyze them. Analyze and track your key service desk metrics. Be empowered. Zoho Analytics connector for ManageEngine ServiceDesk Plus makes it easy to slice and dice your service desk data the way you like. It pre-packages 80+ hand-picked reports on incident management, SLA, technician performance, worklog, and tasks, that help you jump-start your IT analytics from the time you set it up. Your ServiceDesk Plus data gets seamlessly synced to Zoho Analytics. Access a fully featured BI tool from within your ServiceDesk Plus account. Zoho Analytics ServiceDesk Plus Connector provides you with 80+ ready made reports & dashboards, that you'll love and find great value in instantly. Visually analyze and build insightful reports and dashboards with easy drag-and-drop interface. No database queries required! "I needed a rigorous way to analyze and display calling data for our B2B Appointment Setting campaigns. "